« To understand Arsenal’s success we also need to understand what led up to the success. 1977 had seen the most unwelcome of records for Arsenal as on 12 February 1977 the result Man C 1 Arsenal 0 was not just the fourth consecutive game without a win, but also the first of seven consecutive defeats in the league – the worst ever run of defeats, beating the six “achieved” under both Chapman and Knighton, and worse than anything in the relegation year of 1912/13. The run also included four games without a goal, and this with a team including Brady, Macdonald and Stapleton. Clearly work needed to be done and the transfers started early, with Peter Storey leaving on 2 March and Willie Young joining on the same day. 12 March 1977 saw the last of the run of defeats with QPR 2 Arsenal 1. It was followed on 23 March 1977 by Stoke 1 Arsenal 1; Arsenal’s first point in eight games, but it still left the club was still without a win in 11 league matches. On 2 April 1977 Graham Rix played his first game – a 3-0 victory over Leicester in which Rix scored one of the goals. As unlikely as it seems O’Leary got the other two. Wilf Rostrom bowed out after 17 games on 25 April, but by then Arsenal were counting victories, for in an amazing turn around on 30 April, Newcastle 0 Arsenal 2 made it six wins out of seven matches. Macdonald and Matthews scored, although the excitement was short lived as Arsenal failed to win any of their remaining 3 games. The final table with Arsenal in eighth position looked poor but it was a significant improvement on the 16th and 17th of the two previous seasons. And the position of Tottenham at the foot of the league gave rise to a few smiles. Despite Arsenal’s lack of progress in the league the club did have the equal top scorer in the 1st division: Malcolm Macdonald with 25 goals. Quite what the point of the tour of Norway was, is hard to say. The crowds were tiny! But it was organised, it was played, and that was that. The first news from the new season (1 July 1977) was of Kevin Stead signed on free transfer from Tottenham, one year after Terry Neill made the same move as manager. But having made no impact at Tottenham he also made no impact at Arsenal and took part in just two games. On 2 July 1977: Bob Wilson, the goalkeeping hero of the first Double season, re-signed for Arsenal as emergency cover, but didn’t give up his TV work. If you haven’t seen Bob’s article for Untold Arsenal you might enjoy it. It’s worth a read. As is Bob’s Foreword to Arsenal: The Long Sleep, which we’ve recently published). On 8 July Wilf Rostrom moved to Sunderland. He had played 17 league games for Arsenal and scored two goals. In all he played nearly 500 league games, including 317 for Watford later in his career. After ending his playing career he spent a few years in management before leaving football in 1994. Away from Arsenal on 11 July Don Revie resigned as manager of the England national football team after three years in charge. The following day he accepted a four-year contract worth £340,000 to take charge of the United Arab Emirates national team, making him the highest-paid football manager in the world. He was considered utterly disloyal. One does not resign from the England manager’s position – one waits to be sacked. The suits were not amused. Meanwhile also on 12 July Arsenal were back with a very demanding tour that took them across the world for two games in Singapore and two in Australia. A players’ drinking spree in Sydney after the Celtic match, resulted in Terry Neill diminishing his power base somewhat by sending just two of the culprits home including Alan Hudson who did not play for the club again. The rest stayed on for the final game of the tour…. 26 July 1977: Red Star 1 Arsenal 0 (Adelaide, Australia). This was the last game for George Armstrong. He had become Arsenal’s top player for appearances – 621 – at least for a while. The news from back home during this period was interesting as on 17 July 1977 Fulham were banned from the transfer market due to a reported £700,000 debt. On 1 August 1977 Steve Walford signed for Arsenal from Tottenham. He had signed with Tottenham in 1974 but he only played twice for them before Terry Neill, who of course himself at been at Tottenham, signed him for £25,000. Then on 5 August 1977 the ever backwards looking Football League backed the Football Association’s ban on sponsors advertising themselves on player’s shirts. However, non-league clubs were permitted to show sponsor’s names on their players’ shirts. Next up, on 6 August 1977 continuing the Tottenham theme, Pat Jennings signed with Arsenal for £45,000 after 13 years at White Hart Lane. He had played 591 games for Tottenham but his club seemed to think at at 32 he was too old to continue. Or maybe Pat didn’t fancy the rough and tumble of the second division. Or perhaps Tottenham were serious about having to cut costs. Interestingly 32 was Bob Wilson’s age when he retired, and people were shocked at how early he was pulling out of the game. 8 August 1977 saw the first pre-season game which ended Aldershot o Arsenal 1. Jimmy Rimmer played his last game having played 124 leagues, before moving on to Aston Villa with whom he won the European Cup, for the second time (having won it previously with Man U). With Alan Hudson now persona non grata Arsenal presented the 19 year old Graham Rix with this chance, leaving Hudson plus Brady and the year-long want-away George Armstrong at home. Aldershot complete with three ex-Arsenal youth players in the side put up a solid display and it was not until the 80th minute that Macdonald (who had been complaining that he was underweight) crossed for Stapleton to score the only goal of the game. Meanwhile the Islington Gazette ran a special feature on “What’s wrong at Highbury”. It was ever thus. Then on 10 August Don Howe returned as coach under Terry Neill as manager, six years after leaving Arsenal as reserve team coach. He had been at WBA, Leeds and Galatasaray in the intervening six years after leaving Arsenal as reserve team coach. The next day, 11 August 1977 Jimmy Rimmer was sold to Villa. He stayed at Aston Villa until 1983 playing 229 games, winning the League in 1981 and European Cup in 1982. The next friendly was on 12 August 1977 and ended Luton Town 1 Arsenal 1 with 6,315 in attendance. This marked the first appearance of Pat Jennings in Arsenal colours. Pat had played for the under 18 team of Shamrock Rovers while aged 11, and then moved across to Gaelic football returning to Association Football with Newry Town before moving to Watford in the third division in 1963. And thence to Tottenham. And that was it for the friendlies and so the new season got under way in an inauspicious style with a 0-1 defeat to Ipswich. Indeed Arsenal won only four out of the first ten games, but Jennings kept his place and played all 55 league, league cup and FA Cup matches that season. Trevor Ross put Arsenal ahead before Macdonald, returning to the club that converted him from a full back to centre forward, prior to his move to Newcastle, greeted his old friends and then missed a penalty. He also had a goal disallowed late on for pushing, but Luton, with their second half equaliser, held on for a draw. There 30,384 at Portman Road and it was Pat Jennings’ first league game for Arsenal. It rained, and the ground was so slippery that no one could be sure of a) standing up and b) where the ball might end up once it was kicked. No one quite knew what to do and Ipswich took 20 minutes even to get half a shot remotely near the target,. Indeed Ipswich looked there for the taking, being without Mills and Whymark, and that they did score was due to the fact that the one shot that they had skidded in the water, and bounced off Jennings before Geddis prodded it home. It was all a bit like the league cup game at Blackpool; skim the ball off the puddle. No one learned anything in particular save that the English weather is as impossible to predict as it ever was, and the Ipswich drainage wasn’t up to much. Having lost the opener of the season Arsenal needed to win, and on 23 August they did that beating Everton 1-0 with 32,924 in Highbury. It was Everton’s second consecutive defeat, and indeed they would have had more goals had Everton’s new keeper Woods not been on top form. For the goal Macdonald had a swing at the ball with his right foot, it went nowhere near where he intended but Powling took the ball, miss-hit it wildly, and to everyone’s amazement it went into the goal. From that point on Arsenal looked like a side who knew that goals came from slips and errors, and so tried everything they knew (including a lot more errors), but it just wouldn’t work a second time. Game three was on 27 August and it ended Wolverhampton Wanderers 1 Arsenal 1 in front of 22,909. Now the reason for the re-hiring of Don Howe was becoming clear – the defence was looking regimental. Not perfectly drilled as yet, but it was getting there, and seeming that it could quickly become one of the tightest back line in the league. New boy Rix was the star of Arsenal’s show, but the Wolverhampton policy of kicking him to pieces, perhaps knowing in advance that the ref would do nothing about it, paid dividends and ultimately slowed him down. Both goals came from mistakes – but all the time the thought remained, with a solid defence and Macdonald and Stapleton up front, plus Rix and Brady moving forwards, there could be something in this season. Three games down and Arsenal were 13th, but there was not too much despondency. That was it for the league for August, but there was one game left, and on 30 August it ended Arsenal 3 Manchester United 2 in the League Cup 2nd round, with 36,171 in Highbury. Once again there was the feeling: Arsenal were so much better organised than last season. Arsenal ran the midfield, and looked ready to score just when they felt the theatre of the night might demand it. Rix couldn’t believe all the space he got, while Macdonald kept three defenders occupied all by himself. Arsenal took the lead through Macdonald, United equalised on half time, then Brady scored with an endlessly curling shot from 40 yards, before Macdonald ran half the length of the pitch to collect a clearance, take it round the keeper and score. United’s second goal near the end never looked like leading to a third. Brian Clough’s new team were top, Brian Clough’s old team were in the relegation places, while Tottenham were second in the second division. September started brightly on the 3rd with a resounding victory 3-0 over Clough’s Nottingham Forest with 40,810 at Highbury and a general feeling that this was more like it – although there was surprise at just how cautious Forest were. This was also Ritchie Powling’s last game; he had played 55 league games in all and scored three goals before moving on to QPR. Forest failed to make any serious impact on Arsenal’s much more positive use of what was on paper the same 4-4-2 as Forest used, but the result was completely different. As Macdonald was having a quiet day up stepped Stapleton, Brady and Rix to provide the fun. True, questions were by now being asked of whether Ross (like Powling) had quite what it takes, but still, the future looked bright. In the third minute Brady and Nelson exchanged passes and Stapleton provided the finishing touch. The second came from a Ross corner, Bowyer kindly heading to Stapleton who accepted the gift. For the third Burns (who should have been sent off in the first half for his kicking of Stapleton) repeated the trick. Brady scored the penalty. But this being Arsenal in the 70s, it couldn’t last and one week later on 10 September it ended Aston Villa 1 Arsenal 0 with an attendance at Villa Park of 36,929. What made it disappointing was that these were Villa’s first home points of the season as they prepared themselves for a game in Europe through a last minute goal. Gidman crossed to Andy Gray who sent Alex Cropley through to score. The Villa manager, the eternally acerbic Ron Saunders spoke of his team “not even doing the basic things right” Arsenal did indeed make the Villa defence look poor but could not find a way to score even though central defender McNaught looked to have little understanding of the basic rules of the game, let alone what he was supposed to do with them. After what seemed an age of waiting since he had first publicly said he wanted to leave on 13 September George Armstrong was sold to Leicester. He played in both the League Cup finals under Bertie Mee that led up to the three triumphs, and was one of the three all-match players in the Double season. He set up the winner in the final game of the league season against Tottenham. And now, like the rest of those heroes, he was gone. After ten games Arsenal had won four, lost four and drawn two, indicating that once again it was not necessarily going to be a great season. But it had its moments, and on 17 September Arsenal recovered from the Villa defeat to win Arsenal 2 Leicester City 1 with a modest 27,371 in Highbury. Frank McLintock returned to his old club as Leicester manager and saw his team utterly dominated by Arsenal, who for much of the game seemed determined to be easy on their old boy what with Leicester having conceded eight in the last two games. The Sunday Times in their report suggested that Rix was about to overtake Brady in terms of vision and skill; time would tell. On 11 minutes Rix put through Stapleton, who by-passed a lunging foul and calmly scored. For the second Brady put through the perfect pass for Macdonald to run for and tap in. Arsenal then took the pace down, and nothing happened. Indeed Leicester couldn’t manage a single shot until three minutes from the end as Worthington scored from a couple of inches out. But this was Arsenal, as I’ve mentioned before, and on 24 September we came back to earth with Norwich City 1 Arsenal 0 a mere 19,312 bothering to show up at Carrow Road. It was Steve Walford’s first game since signing from Tottenham for whom he had played two games. He went on to play 77 league games for Arsenal. Indeed such a comment was just about all Arsenal could say about this game. They hammered Norwich into the ground, but nothing would go in. Norwich had a couple of attacks all game, resulting in two shots, of which one went in. So it goes. Arsenal were now mid-table, but there was particular interest in the plight of Newcastle, who had ended the previous season 5th. October began with another home win, the result on the first of the month being Arsenal 3 West Ham United 0, a very healthy 41,245 turning up for the derby. And although it was only October the press were already talking of WHU (with only one win in eight), as relegation fodder. “Threadbare and lightweight in attack, gullible and faulty in defence,” as the Times put it. Being nervous West Ham tried the defend-defend-defend approach but simply weren’t very good at it and on the half hour Stapleton scored, to make the game plan pointless. Even with Macdonald seemingly having an off period (he missed two in the last ten minutes) everyone else’s form was good. For the second goal Rix held the ball for what seemed an eternity waiting for Rice to arrive to head home. Brady made it three with a perfectly placed penalty. But Liverpool, destined it seemed to be top of the league year after year, were a different proposition, and on 4 October Arsenal played out a goalless draw with them at Highbury, but once again with a very good crowd: 47,110. Having run into what for them could be called a poor patch of form, Liverpool copied the growing craze for mass defensiveness away from home. With Jennings in goal at one end and Clemence at the other that meant 0-0 was the most likely outcome from the kick off, especially when the two keepers seemingly agreed to bypass all the other players and lob the ball to each other for a bit of catching practice. Macdonald for Arsenal and Dalglish for Liverpool did their best to get something from the game, and although Liverpool knew they were hardly an advertisement as Champions of Europe, they didn’t seem to care. Away from home however things were different, and Arsenal did not yet have the ability to shut out the opposition as Liverpool could do. 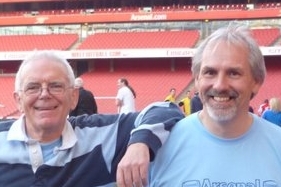 And so on 8 October we had Manchester City 2 Arsenal 1, but once more with a high attendance figure: 43,177. Peter Simpson was sent off for the first time in a 17 year career, and even the Man City winger Peter Barnes (who scored after three minutes) thought the dismissal for a second foul on him by Simpson was ludicrous – and indeed said so to anyone who would listen. Pat Rice was also booked by a referee who clearly had matters other than the game on his mind and so Rix and Brady did all they could to overcome the ref’s approach. Macdonald equalised the opening goal from a pass by Rix. But the sending off gave City the penalty and Tueart scored to give them the victory they, and it could be argued, the ref, wanted. Back to Highbury for the next match on 15 October and back to winning ways in another London derby, this one ending, Arsenal 1 Queen’s Park Rangers 0, 36,290 in attendance. “We came here to frustrate them,” said Rangers’ Manager Frank Sibley, “and to make them play badly.” Eight behind the ball was normal, nine when Arsenal prepared to launch an attack, ten in extremis, eleven when it was panic stations. Bowles led the occasional flurry into Arsenal territory, but flurry was all you got. Sometimes a shot (as with one from Hudson) could be blocked by one player, while seven more waited behind as backup in case needed. Arsenal tried to go forwards slowly – but as a tactic it added to the frustration. The goal came as a loose ball was punted into the net by Macdonald leaving QPR not the first team to realise how hard it is to go from mass defence into any form of attack. And then, at last, an away win, and a spot of revenge for the difficulties Bristol City had presented to Arsenal in the past, as on 22 October it ended Bristol City 0 Arsenal 2, with 25,497 at Ashton Gate. After a dreadful midweek display in the semi-final of the Anglo Scottish cup against Hibernian, City’s style had seen them labelled by Eddie Turnbull, the Hibs manager, as, “the butchers of Bristol,” and the referee clearly decided from before the start that he had to be the man of the match. As a result he decided to book virtually any tackle that any player dared to put in – fair or foul. Unfortunately he then got confused as to who the butchers were, and booked Nelson, Young, and Brady, although he did also find time to book Gow of City as well. But despite the ref’s efforts the City hoodoo which saw them do the double over Arsenal last season was overcome, thanks to Rix in the 44th minute and Macdonald in the 88th, but it was hardly a game to remember. The positive feel of the month continued on 25 October with the third round of the League Cup, and a surprising attendance of 40,749 witnessing Arsenal beat Southampton 2-0. On 75 minutes Rix floated in a cross, Holmes handled in the penalty area for no reason at all, and Brady strode up and took the penalty. As a result, for the first time Southampton were forced to move forwards and attack and suddenly the game opened up. Rix once more put in a cross, and this time Arsenal needed no help from disorientated defenders, as Stapleton strode forward to end the affair. The press made much of the fact that for those first 75 minutes Arsenal could not break through, but the truth is when the defence is 10 man strong (occasionally for variation reverting to an 11 man affair), it takes an opening goal to deliver the football match. Ball did his bit for Southampton, but it was never remotely enough. But just when it all seemed to be going well, the month ended with a bit of a let down, the result being Arsenal 1 Birmingham City 1, on 29 October, the crowd dropping back to 31,355. This was Trevor Ross’ last senior game for Arsenal and was followed by a significant falling out with Terry Neill. Keith Bertschin had scored with his first touch in senior football – a header after coming on as sub for Ipswich at Highbury in 1976. He scored against Arsenal again the following season and now did the same for Birmingham. Post match he reminded anyone who would listen that he had been with Arsenal as a school boy but had been rejected. With Want in goal and Hibbitt in midfield stifling every Arsenal attack, it was only a late equaliser by Rice that gave Arsenal a point. Macdonald looked off form throughout and reported after that he had both a twisted knee and a trapped nerve. Four days later Trevor Ross was sold to Everton for £170,000. According to Ross’ own account he had started a reserve match the day before but Terry Neill had seen him playing and said, “You, Off. You don’t want to play for this club so get off.” Again according to Ross he then took off my shirt and threw it in his manager’s face. On the same day as Ross left Alan Sunderland transferred to Arsenal for £220,000. He made 23 appearances in the rest of the season and scored four goals, playing alongside Brady, Macdonald, Stapleton and Rix. It was starting to look like a rather interesting combination of forwards and midfielders. The new month started very brightly for both Arsenal and the new man Sunderland on 5 November, with Manchester United 1 Arsenal 2, 53,055 in Old Trafford. Macdonald and Stapleton got the goals in a run of six league games without a defeat. Manchester United had started the season in promising style, but early October they had been on the slide, and this game was heralded as the moment when they would surely get themselves back on track. For an hour it looked as if they might at least get a point; the few attacks they had were saved by Jennings, and in truth Arsenal offered little as Rix, Brady and Sunderland looked like men who felt aggrieved at being forced to spend 90 minutes in the Manchester rain. But Hill scored for Man U on 60 minutes, and suddenly Arsenal awoke. Macdonald equalised six minutes later. Then on 83 Grimes tried a back heel near the goal, Stapeleton took it and scored from 20 yards. That set the scene for Arsenal to continue to march onwards, what with Coventry City being the next visitors to Highbury, but on 12 November the result was disappointing: Arsenal 1 Coventry City 1, and just 31,653 in the crowd. Indeed after just 3 minutes Arsenal were a goal down as the defence were caught flatfooted. Worse, on seven minutes Macdonald was sent off for throwing a punch after Yorath had brought him down with a horrific tackle. Coventry must have expected that this would be the end of Arsenal but in fact it invigorated them with Rix, Brady and Price playing as if each was making up for being one man down. Arsenal’s equaliser came from a fierce cross from Rice. Coop saw the advancing hordes, put out a foot and the ball went into the net. Arsenal had the better of the second half but just couldn’t find the second goal. However recovery was at hand as on November 19 we had Newcastle United 1 Arsenal 2, but with a poor crowd of just 22,880. Bill McGarry, once of Bournemouth, once of Wolverhampton, and now of Newcastle, the man who claimed to have “discovered” Sunderland (who scored for Arsenal), now faced a hostile home crowd. It was a crowd that was desperate for Macdonald (who wasn’t playing) to return to the fold, and which had nothing to celebrate – except for the fact that Newcastle went ahead just after half time. Stapleton got the equaliser within minutes before Sunderland got the winner on 75 minutes. Defeat to Arsenal left Newcastle five points away from safety, while Macdonald, always happy to put the knife in and give it a twist, said the Geordie fans deserved better. McGarry criticised his own team in public (never a clever thing to do) for playing too many short balls, and then said he would not criticise his team. It was that sort of day. On 22 November 1977 Arsenal played a friendly against Tottenham at Highbury as a testimonial match for Pat Rice. It ended 1-3, with Stapleton scoring. It was a disappointing, but not too worrying a result, but then on 26 November the score of Arsenal 1 Derby County 3 rang greater alarm bells. 31,989 saw a game in which Arsenal could have been 3-1 up by half time but two shots by Macdonald were fortuitously blocked and the game seemed locked at 1-1. Even Derby’s opener seemed a fluke as Stapleton back headed to his keeper, only to find he wasn’t there. Nelson’s goal to put the teams at 1-1 with a powerful shot after Brady’s free kick had rebounded. But after those two earlier misses, Arsenal looked and ultimately were, a spent force and couldn’t contain Derby’s late surges to take the points. Rioch produced a shot that seemed, at different points in its trajectory, to bend left and right, which ultimately had Jennings rooted to the spot unsure where to go and Arsenal had no way back. But this seemed to be a season when recovery could come rapidly and on 29 November in the fourth round of the League Cup 25,922 saw Arsenal beat Hull City of the second division 5-1. With Billy Bremner playing in the wise old man role (something that never ever suited him), Hull looked to him to sort things out, but he looked way beyond his sell by date and had nothing to offer. After scoring five Arsenal eased up, and at the death conceded a penalty. Picking the ball from the net was the only time Jennings touched it all night. And so into December and the results kept rolling along, as on the third of the month it was Middlesbrough 0 Arsenal 1, just 17,422 in the crowd. Last season Neil said of Arsenal at Middlesbrough that on the day “we could not have defeated a team of dustbins.” This season, although it took an own goal by Terry Cooper, Neil concluded that Arsenal could well win the league. However this optimistic note was put into context by the fact that the game was petering out into a goalless draw when Cooper, in the last minute, attempted a back pass but instead scored a perfect goal, placing the ball beyond the reach of his keeper. Had he scored at the right end there would have been talk of the goal of the season. In the after-match interviews Macdonald called Middlesbrough a third division team playing without confidence. Possibly so, but in that case Arsenal should have scored themselves, rather than waiting for fortune to help them along. Middlesbrough in fact survived in the top league until coming bottom of the league in 1981/2. By 1986/7 they were in the third division. A week later it was back to Highbury for the regular grudge match which ended Arsenal 1 Leeds United 1, 40,162 turning up to express their dislike of the opposition. It wasn’t a game to remember and a significant part of the crowd had already left Highbury (perhaps to pick up a spot of Xmas shopping on the way home) when Harris got Leeds’ equaliser, with 88 minutes gone. Without Lorrimer, Jordon and Hankin, Leeds looked blunted in attack and Willie Young so relished his task that he not only scored but engaged in the occasional back heel, much to the crowd’s delight. However with Rix having an off-day and Brady man marked by Currie, the going was tough. The goal came from a Brady free kick, headed on by Stapleton and belted home by Young. Arsenal however failed to take the opportunities offered and when Leeds equalised it was just about what they deserved. For reasons that now escape me Arsenal then went off to Kuwait to play Qadsia on 12 December in a friendly that ended 1-1, Stapleton scoring. But then on 17 December things were back to normal and it ended Coventry City 1 Arsenal 2, in front of a modest gate of 20,993. Arsenal approached this game with confidence and a strong sense of authority and purpose. To be fair, Coventry missed Holton in defence, but even so Arsenal had so many variations at their disposal that it looked as if there was nothing Coventry could try that would give them a victory. The first goal came on 34 minutes as Brady sent Nelson on the overlap before he centred for Stapleton to head home. In the second half Rix took a corner, Stapleton directed it straight into the goal. Arsenal then put the ball in the net for a third time but Young was adjudged to have fouled someone (no one quite seemed sure who). With eight minutes to go a rare Coventry attack brought a penalty, and reduced the arrears but Arsenal were never in danger. Thus Christmas day came with Arsenal in good mood, and to celebrate it on Boxing Day the result confirmed the feeling, as it was Arsenal 3 Chelsea 0, 46,074, taking time off from the festivities and washing up to enjoy the game. Alan Sunderland, having been impressing more and more in each game since his transfer, turned on a master class to show Arsenal fans just what he could do. Playing as a right sided attacker he was involved in both of Arsenal’s first half goals – centring for Price to head home on 14 minutes, and again nine minutes later passing to Rix for him to score with a stunning shot from the edge of the area. David O’Leary revelling in the additional seasonal goodwill of a 10 year contract, finished Chelsea off when he latched onto a Rix corner in the 50th minute – but Chelsea had looked dead and buried long before half time. This being the 1970s, and worries about injuries and burn out being less than in the 21st century game, no one thought anything of the fact that the following day Arsenal were playing again, and it ended on 27 December with another victory: West Bromwich Albion 1 Arsenal 3, with 27,723 at the Hawthorns. For West Brom it was their second 3-1 defeat in two days. For Arsenal, the team that the previous season had had their all time worst sequence of defeats, this was now their sixth away victory in succession, knocking in two in the first 13 minutes before seeing out the rest of the game on cruise control. West Brom tried to play football, and then, discovering that the ref was clearly still celebrating Xmas by letting everything and anything go, resorted to any sort of foul imaginable in order to break up the continuous stream of attacks. Ultimately Robertson was rightly sent off for one lunge too many but by then half their team should have gone. A slight balance was returned with a foul that was marginally outside the area mistakenly resulting in Brady’s penalty. But with Macdonald having to have six stitches from a leg wound as a result of one insane tackle, and half the team limping from the constant “if I can’t get the ball I’ll get the man” battering. Arsenal knew the victory had come at a price. And thus with the walking wounded patched up to play yet another game on 31 December 1977, we had Everton 2 Arsenal 0, before a crowd of 47,039. With Nottingham Forest opening up a significant gap at the top, Chelsea beating Birmingham 5-4 away, and Tottenham knocking four past Blackburn, Arsenal needed to win in style to show they were still in contention. Sadly neither Arsenal nor Everton could display any style, which made the defeat even harder to take. Everton went ahead on 15 minutes with a shot that on other days Jennings would have stopped. On 50 minutes Macdonald had the chance to equalise after beating the off-side trap, but with just the keeper to beat he seemed to lose his nerve and finished tamely. A minute later he was taken off and replaced by Simpson. After that Rix and Brady ran the show but with Macdonald off there was no one to provide the equaliser, and Everton broke on 76 minutes to secure the win. Exactly half of Arsenal’s wins by the end of the year had come away which was encouraging. What was less encouraging was the sort of lead that last season’s second division third placed team had now opened up at the top of the first division – and indeed just how many goals they were scoring. But what made the season even more satisfactory than the league position was that following the record number of consecutive defeats in the previous campaign, Arsenal had gone on a run with one defeat in 12, and prior to the Everton game a run of four wins and a draw in five. Current series: Arsenal in the 70s. Arsenal in the 70s part 4: What went so right in 1971, and why did it go wrong? Arsenal in the 70s part 5: After the double, double doubts. Arsenal in the 70s part 6: The winter of blossoming hope. Nov 71 to Jan 72. Arsenal in the 70s part 9: July to Dec 1972. Indiscipline and invasions. Arsenal in the 70s part 11: July to Dec 73, the world falls apart and Arsenal sinks. Arsenal in the 70s part 12: Jan to June 74. Farewell Bob, hello Liam. Arsenal in the 70s part 13: July to Dec 74. Flirting with relegation. Arsenal in the 70s part 17: The summer of 76. New manager. New superstar. Arsenal in the 70s part 19. Jan to June 77. Arsenal’s worst ever run. Jimmy Hill stoops low. 1 comment to Arsenal in the 70s Part 20: July to Dec 1977 – signs of recovery.